Twenty five years after its first involvement with diesel rail traction, Paxman published a brochure entitled 'Paxman Diesels for the World's Railways' . Publication No 1528 carries a printmark CL857 indicating it was produced in August 1957. Its intended purpose was to illustrate the wide variety of operational and climatic conditions under which Paxman engines were then being used for rail traction duties around the world. By 1957 Paxman engines were powering freight, passenger, and shunting locomotives in places as far apart as South America, Norway, Africa, India and Australia, frequently under arduous operating conditions. Brief descriptions of several of these applications appear in the publication, accompanied by photographs. The text of the descriptions of overseas applications is reproduced below, together with several of the photographs (a couple of pictures come from other sources). In retrospect the extent of the Company's worldwide involvement in diesel rail traction by 1957 is remarkable. 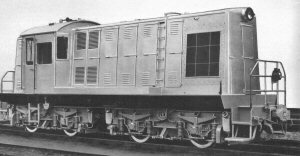 While it is true that a Paxman engine was installed in a locomotive as early as 1932, the Company's activities in this field up to 1939 were restricted mainly to some small industrial shunters in Britain. All rail traction work had to be shelved at the outbreak of war in 1939 and could not be taken up again until hostilities ceased. In effect the worldwide rail traction presence mirrored in Publication 1528 was achieved in just 12 years from 1945. To put the achievement in context, one should not overlook the many restrictions which faced Paxman and other British engineering companies in the post-war period, such as shortages of materials and skilled labour. At the time there were also other heavy demands on Paxman's resources such as those of the Royal Navy which needed to replace wartime losses, and of the oil industry which required large numbers of engines for powering drilling rigs. One should also remember that in the mid-1950s main line diesel rail traction was a rarity in Britain. The British Railways Modernisation Plan for dieselisation and electrification of its network was not published until January 1955. Up to this time all main line traction was steam with the exception of a small handful of experimental diesels, such as the Paxman-engined 11001, 10800, and 10100. Other than the notes and the sections on Great Britain and on the Benguela Railway, the following is taken verbatim from Publication 1528, as are the lists of some users of Paxman traction diesels reproduced at the end of this page. Railway enthusiasts are invited to contact me with details of additional brief points of interest about any of the following railways or locomotives for possible inclusion in the notes. These 39 ton locomotives handle trains up to 600 tons weight in the yards of the Perth-Freemantle area and lesser weights in the up country yards; some units are engaged in line freight service in the Geraldton area. Along with various classes of railcar, they are well maintained at the Perth diesel depot, where opening up of the Paxman 12RPH engines for top overhaul takes place every 4,000 hours; although a number of engines have now operated for more than 14,000 hours, none are within measurable distance of needing a complete overhaul. NOTE: (i) On order in 1951, these 3' 6" gauge Y class locomotives were built by the Clayton Equipment Co at Hatton, Derbyshire (1) for British Thomson-Houston. Nearly all were in service by early 1955. (ii) The locomotives had aggregated well over 400,000 working hours up to the end of 1960. By this time engines in service had reached from 10,000 to 28,000 running hours each. 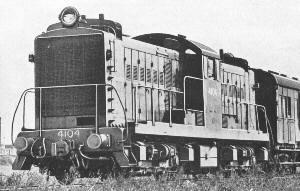 The 10 heavy Bo-Bo twin engined diesel-electric locomotives of 1,000 bhp introduced in 1953-54 on the New South Wales Government Railways handle a large amount of the freight transfer traffic in the Sydney area, but owing to severe gradients, sometimes as steep as 1 in 40, trailing loads are usually limited to 800 tons. In a general way, these 10 units do the work of 30 steam locomotives. Additional to freight traffic, they also handle morning and evening workmen's trains, and their cooling systems have been modified so that they can undertake long distance main line duties. They have now, by consistent working, accumulated 200,000 engine service hours. NOTES: (i) Ordered in 1950, these 4' 8½" gauge NSW 41 class locomotives were built by Metro-Cammell for British Thomson-Houston. The 41 class was powered by two 12RPH Series II engines, each with a rating of 500 bhp at 1,250 rpm. Denis Turner recalled that early on there were some overheating problems with these locomotives when hauling double headed trains. The explanation is straightforward. As will be seen in the above photograph, the cooling radiator is located at the front of the locomotive. In double headed operations the flow of air to the second locomotive's radiator was largely blocked off by the leading locomotive. (ii) By July 1961, the locomotives had accumulated 400,000 engine service hours. Two classes of Paxman engined diesel-hydraulic locomotives give outstanding shunting performance on the 3 feet 6 inch gauge lines of the East African Railways and Harbour Board - namely the 42 ton, 312 bhp, 83 class and the 52 ton, 500 bhp, 84 class. Both of these have Vee engines with identical principal and wearing parts. Working in conjunction with well thought out schemes of maintenance and personnel training, the smaller units have built up an aggregate 70,000 hours service since introduction in the winter of 1955-56, with an availability of 93 per cent; the expectations of the operators are that the engines will each complete 50,000 hours of service before pistons, liners and bearings require renewal. Three units allocated to Tanganyika are engaged in haulage of 250 ton freight trains over a ruling gradient of 13 miles at 1.5 per cent (1 in 66). NOTES: (i) Both classes were built by North British Locomotive Company at its Queens Park works under orders L52 and L53 of 1952. The 83 class locomotives were NBLC works numbers 27498-501 and 27525-534. The 84 class were NBLC works numbers 27502-504. (ii) I have been advised that although the above extract from Paxman Publication No 1528 refers to 'the 3 feet 6 inch gauge lines of the East African Railways', the EAR was and is one metre gauge. The inconsistency may well be explained by some comments received from Chris West: "The German heritage of Tanganyika and the use of secondhand equipment from India in Kenya ensured that the East African Railways & Harbours' tracks were of metre gauge. However, it was long accepted that the use of metre gauge, on a continent where 3' 6" (1067mm) was more common, was an anomaly. Consequently, it was normal for the EAR&H locomotives to be designed so that they were readily convertible from metre to 3' 6" gauge. Whilst I cannot see anything to confirm that the North British locomotives were built as gauge convertible, this was almost certainly the case." 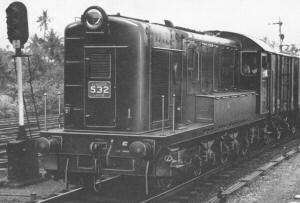 (iii) The 83 Class locomotives had 8RPHL Series 2 engines, rated 312 bhp at 1,250 rpm. The 84 Class had 12RPHXL Series 2 engines, rated 510 hp at 1,250 rpm. Both classes had Voith-North British hydraulic transmissions. (iv) By July 1961, the 83 Class locomotives had built up an aggregate 250,000 hours service since their introduction. The ambient temperature is 110 degrees F or more and for many months, sand and dust storms are prevalent, and on the Kandla-Deesa route, over which they now haul all the traffic, they are a long way from any large repair shop or well equipped maintenance depot. Nevertheless, these locomotives, introduced into revenue service in 1956, have covered an aggregate mileage in excess of 1,500,000 and the pressure-charged 12 cylinder, 7in. bore engines have given a steady performance over a period of 95,000 running hours. NOTES: (i) Ordered by the India Store Dept on behalf of the Indian Railways, the locomotives were built by the North British Locomotive Company (order L54 of 1953). The work was divided between NBLC's Hyde Park and Atlas works. The locomotives were allocated works numbers 27505-524 and fitted with 12RPHX engines and Voith-North British type L36r hydraulic transmissions. One source says the engines were originally rated at 605hp but engine design changes increased this to 625hp in June 1954. The locomotives were originally given WR numbers 3001-3020 and were known as class DY. In the photograph above is 3004. They were subsequently renumbered 6000-6019 in the All-India number series and given class YDM1. The class were quite successful. They were rebuilt by Chittaranjan Loco Works in 1974-6 when they were fitted with Maybach engines. (ii) By July 1961, these locomotives had covered an aggregate mileage in excess of 6,000,000 and the engines had performed over a period of 320,000 running hours. (iii) The metre gauge Kandla-Deesa line covers a distance of 170 miles. On the privately-owned Emu Bay Railway, hard slogging service is required from the diesel units, and the 530 bhp diesel-hydraulic powered locomotives must, each day, climb 25 mile up gradients of 1 in 33-40 from sea level to about 2,400 feet; and in the 70 mile run with silver-lead ore load the whole train is on straight track for no more than five miles. The climate varies to extremes, and a particular feature has been the ease of starting the 12 RPHX engine after a weekend standing in the shed open to winds from the Antarctic. Something like £60 a round trip of 140 miles is saved over the costs of steam haulage, an economy of great importance to a comparatively small railway. NOTES: The above text suggests more than one Paxman-engined locomotive was supplied to the 3' 6" gauge Emu Bay Railway but all the evidence points to only one. The order was placed with the North British Locomotive Company (order L9), by agents Knox, Schlapp (Pty) Ltd in 1950. Built at NBLC's Queens Park works, the 0-8-0 locomotive was allocated works number 27080 and had Voith type L37 hydraulic transmission. Introduced into service in 1953 it was designated PVH1 (later PVH21), the PVH class name being shorthand for Paxman Voith Hydraulic. The locomotive was withdrawn from service in mid-2001 and went into preservation on the Derwent Valley Railway, New Norfolk (near Hobart, Tasmania), in July 2001. No railway in Bolivia is less than 9,000 feet above sea level, and on the 164 miles Potosi-Sucre line over which operate two Paxman-engined diesel-electric railcars the altitude varies from 9,000 to 13,000 feet, and the line runs round incessant curves and up long gradients of 1 in 33. These installations have Vee 6 engines, pressure-charged in order to maintain output at high altitudes. Despite primitive operation, the cars are often worked in convoy to deal with the day's passenger traffic in one "caravan", largely because of constant rock falls - these two cars have each put in 8,000 service hours in less than three years, which, because of the traffic requirements, represents a very high availability. NOTES: The Bolivian State Railway placed the order for the two railcars (Nos 6164 and 6165; BTH Works Nos 1029 and 1030) with British Thomson-Houston as main contractor. They were built by D Wickham & Co, of Ware, Hertfordshire, from whom they were despatched on 2nd October 1953. The 6 cylinder RPHXL engines, numbers 000017/5 and 000017/4, were each rated 250 bhp at 1,250 rpm and each car was fitted with two BTH traction motors. Spare parts for the final drive were provided in September 1965. The Ghana Railways, and their predecessors the Gold Coast Railways, have not a long diesel traction history, and first units of any type date back only to 1955, though Paxman-engined industrial diesel locomotives have been at work in the country for 20 years. The latest diesel acquisitions of the 3ft. 6in. 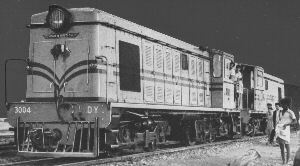 gauge Ghana Railways are 13 light diesel-electric locomotives of Bo-Bo wheel notation intended for heavy shunting and secondary line services, put into operation in 1957. Each locomotive is equipped with a Paxman 7in. bore 12 cylinder engine set to give an output of 410 bhp under tropical conditions of heat and humidity. A feature of these locomotives has been made of running all pipe, gauge and cable connections to a special bulkhead easy of access, and on which erection or dismantling can be done with utmost convenience. NOTES: Built by Birmingham Railway Carriage & Wagon Co, these 42 ton locomotives were each fitted with a 12RPH Series II engine and Crompton Parkinson traction motors. Continuous tractive effort was 10,000 lbs at 10 mph and the maximum speed was 45 mph. In addition to shunting they were later used for main line passenger runs between Takoradi, Kumasi and Accra. 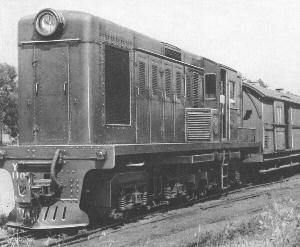 Few more successful examples exist of diesel shunting locomotives in the tropics than the six 312 bhp three-axle diesel-hydraulic locomotives of the metre gauge Malayan Railway. Going straight into service on arrival at Kuala Lumpur in 1955, they now effect almost all the shunting over the extensive harbour trackage at Port Swettenham, and deal with works and station traffic at Kuala Lumpur. These units, with V-6 cylinder pressure-charged 7in. bore engines, had by the middle of 1957 accumulated about 70,000 working hours, with not a single piston lift in the first 45,000 hours. NOTES: The locomotives were built by North British Locomotive Company (order L50 of 1952) at its Queens Park works and allocated works numbers 27482-487. Additional details are given in "Locomotive Centennial" by Haji Shamsuddin, published in Malaya in 1985. Painted olive green, the locomotives were delivered in 1954. The 16 class was powered by vee-form 6RPH engines driving Voith-North British L24V Hydraulic Torque Converter Transmissions. Total weight was 36 tons with a 12.25 ton maximum axle-load which was kinder on wharf areas than the (English Electric) 15 class. All six locomotives remained at Swettenham for some years until the completion of the Port Dickson refinery complex when they were sent to service that area. They remained at work until 1980 and one has been sent to the Railway Museum, the other five were cut up in December 1984 at Sentul Workshop. Three notable locomotives in Peru incorporate Paxman 7in. by 7¾in. "V" engines. They are notable first in that they incorporate a six-speed mechanical transmission for heavy freight service; and secondly because their life is spent in an area that receives perhaps three or four days' rain a year and in some years not even that. The two 550 bhp 55 ton four-axle locomotives on the Paita-Piura Railways day by day undertake haulage up gradients of 1 in 29-35 over rough and unballasted track and with ambient temperatures well over 100 degrees, and on a 62 mile railway separated by a hundred miles from any other railways; the third locomotive, with identical power plant, is a 51 ton six-wheeler engaged in freight transfer and yard shunting in the Lima-Callao area. Dynamometer car tests with the four-axle locomotives showed that a drawbar pull of 39,000 lb could be sustained, and with the engine running under maximum torque at 850-875 rpm, 540 ton mineral trains could be hauled with the greatest steadiness up 3½ miles of 1 in 60. NOTE: Locomotives were built by the Hunslet Engine Company and fitted with 12-cylinder RPHL engines. 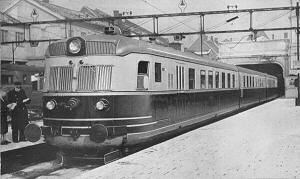 Shortly after the War, the Norwegian State Railways, wishing to rehabilitate its system as quickly as possible, ordered a number of lightweight Paxman 12 cylinder "V" engines of the RPH series for installation in fast diesel trains for long-distance services. These trains had been conceived before the war, and superstructures and bogies were already in existence. A 500 bhp engine and set of hydraulic transmission was fitted at each end of the set, with the result that accelerated and comfortable services were provided between, for instance, Oslo and Bergen. Operating during the winter under severe snow conditions, with something like 9 or 10 hp per ton of weight installed, considerable speed up long 1 in 40 gradients has been possible. 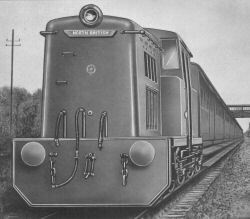 An early post-war application of Paxman pressure-charged "V" engines was the eight double-bogie diesel-electric broad gauge locomotives for the Ceylon Government Railways. 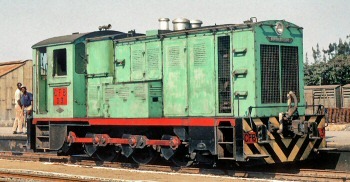 Intended originally either for the heaviest shunting in the Colombo district or for secondary freight services, the lines of diesel development in Ceylon have in practice resulted in them being confined largely to yard work. They now have six years continuous operation behind them, and show great consistency of performance between one unit and another. Total operating time is now of the order of 240,000 hours, and the General Manager of the railway has stated that "The cylinder liner wear figures have remained steady throughout at 0.0005 inches per thousand engine-hours on a 7in. bore. The dream of most engine builders has thereby been achieved." NOTE: The 5' 6" gauge Class G.2 locomotives were built by the North British Locomotive Company and shipped to Colombo during the summer and autumn of 1951. The 54 ton locomotives entered service in 1952, had a tractive effort of 35,000 lbs and a maximum speed of 20 mph. Turbocharged 12RPHX engine rated 625 bhp at 1,250 rpm, driving a GEC generator. Economic recessions and increased road transport over what is most difficult country has limited the number of diesel locomotives on the standard gauge Mauritius Railways, on which most of the traffic is in connection with the sugar industry. Though of short length - no more than some 91 miles - gradients are continuous from the two coastal termini to the central summit, with miles of 1 in 27-29-33-40 gradients and rails slippy with damp vegetation. But the two 50 ton Paxman-engined diesel-hydraulic locomotives handle maximum tonnage up the two banks with altogether exceptional steadiness and regularity; and this, and their general economy over steam traction, have been factors in putting back the closure of the railway, which has been mooted more than once. NOTE: Locomotives built by the North British Locomotive Company. Pressure-charged 12RPHXL engines, each rated at 625 bhp. At the time of writing, the 13,000 miles Government railway system of the Union has not adopted diesel traction, largely because coal is still no more than 12s. 6d. (62½ new pence) a ton on the tender. But industry is dieselising its transport at a rapid rate; and both here and in Rhodesia (now Zimbabwe) are an appreciable number of 50 ton diesel-hydraulic and diesel-mechanical locomotives powered by Paxman engines of 500/550 bhp, and operated in the short-distance haulage of long ore trains, and in the most arduous shunting in the congested and dirty areas of mining and steelworks, in both of which exceptional reliability is required from the power plant. 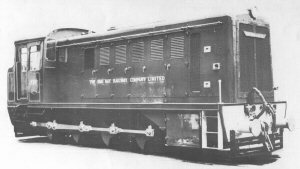 NOTE: Two of the industrial locomotives referred to above were powered by 12 cylinder RPH engines and built by Hudswell Clarke & Co for the Iron & Steel Corporation of South Africa (ISCOR) - see photograph. 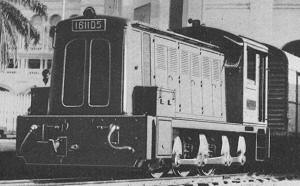 A report in the March 1958 issue of Diesel Railway Traction states that four of these locomotives were supplied to ISCOR. The first two of these 0-8-0, 3' 6" gauge, 64.3 ton locomotives were shipped in 1955, for duty in ISCOR's steelworks near Pretoria. They had 12RPHL Series II engines, rated at 450 bhp, driving through a fluid coupling to a 3-speed SSS gearbox, with high and low ratio gears. This section of the brochure summarises Paxman's pioneering work with diesel rail traction in the early 1930s. It also describes the Paxman-engined post-war prototype locomotives Nos 11001, 10800, and 10100. Information on these can be found on the Diesel Rail Traction page. 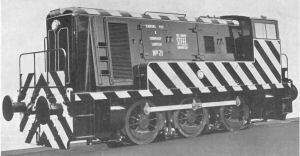 By the mid to late 1950s one of the principal rail traction applications of Paxman engines in Britain was powering industrial shunters, particularly in the steel industry. Dust-laden atmospheres, large variations in ambient temperature, and heavy sustained loadings provided an arduous operating environment. Steelworks shunters were required to work continuous 24 hour-a-day rosters with a high degree of reliability for a fortnight to a month between shed days for maintenance. In 1957 Paxman estimated its engines powered about 60% of all steelworks diesel locomotives in Britain. By 1959 the proportion was reckoned to be more than 65%. The engines were used with all three main types of transmission - mechanical, electric, and hydraulic - and by five builders including Hunslet, Ruston and Yorkshire Engine Company. Typical examples were two shunters built by the Yorkshire Engine Company and dispatched from their Sheffield works in early 1954, one to the Shotton Works of John Summers Ltd, the other to Samuel Fox & Co of the United Steel Companies group. The latter is pictured above. Each 50 ton six wheel locomotive had a 12RPH Series II engine, using a diesel-electric arrangement to drive two British Thomson-Houston traction motors. Because of the need for an exceptionally high degree of operating reliability, the engines were conservatively rated with an output of 400 bhp at 1,250 rpm. The 24 Paxman Hi-Dyne locomotives in service with Sierra Leone Government Railways supply all this Company's main line passenger service requirements. The railway is a light construction and the locomotives have a low axle loading requirement. They employ the Paxman Vee-form diesel in a "constant horsepower" mechanical transmission system. This principle gives a smooth stepless speed/tractive effort curve without any break in drawbar effort at gear changes. There are now 32 diesel-electric Bo-Bo locomotives of this type on order or operating in Italy, Sicily and Sardinia. This particularly arduous mainline passenger service frequently operates in districts where difficult gradients predominate. The engine installed is a Paxman 12-cylinder Vee-form design. Two prototypes were rated at 1,320 bhp at 1,000 rpm but successful running experience permitted a rating of 1,500 bhp for the remainder. The engines are manufactured in Italy under licence by Breda. NOTE: Motori Breda of Milan built thirty seven 12YJCL (Ventura) engines under licence for thirty five of these Italian State Railways D.343 Class diesel-electric locomotives. 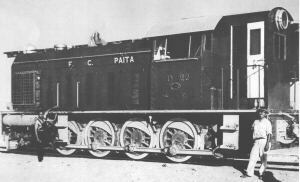 Paxman supplied six 8 cylinder RPHXL engines for 40 ton 0-6-0 DH (diesel-hydraulic) freight transfer locomotives for the Benguela Railway (CFB - Caminho de Ferro de Benguela), in what is now Angola. All six engines were rated 425 bhp at 1,500 rpm (at sea level). The first four were 8RPHXL Mk 4 types. The first two of these, Paxman serial nos. 601002/3 and /4, were despatched in April 1961. They were fitted in North British locomotives, completed in 1961, which became Benguela Railway nos. D1 and D2. The second two engines, a repeat order, were Paxman serial nos. 601034/1 and /2. Despatched in December 1961, they were installed in North British locomotives completed in 1962 which became Benguela Railway nos. D3 and D4. These four locomotives had Voith NB L24V hydraulic transmissions. Benguela Railway No D3 at Lobito in August 1972. Photograph © and courtesy of Peter Bagshawe. The last two engines, Paxman serial nos. 701012/11 and /12, were 8RPHXL Mk 7 types, delivered in April and May 1972. Paxman also supplied the British Twin Disc three-stage torque convertor transmissions. The engines and transmissions were installed in locomotives built by Andrew Barclay, as by this time the North British Locomotive Company had gone out of business. The Andrew Barclay locomotives were completed in 1972 and arrived on the Benguela Railway in January 1973. These were numbered, probably from the start, D11 and D12. The six locomotives probably spent most or all of their working lives operating in and around Lobito. John Fowler & Co. (Leeds) Ltd.
Acknowledgements: My thanks to Chris West, a railway enthusiast, whose research produced some of the additional details given in the notes above on various locomotives. Chris mentioned that one of his main sources of information on the North British locomotives was Giants of Steam - The Full Story of the North British Locomotive Co. Ltd , by Roger P Bradley, published by OPC in 1995. Information about the Western Railway of India locomotives is also drawn from Indian Locomotives - Part 4 by Hugh Hughes, published by the Continental Railway Circle in 1996.